An inspirational hairdresser, whose dedication and commitment has seen him go from apprentice to salon owner, is celebrating after being recognised in the regional finals of a national competition. Liam Hogan (26), from Burnley, was given a Highly Commended accolade in the regional final of the National Apprenticeship Awards. Held at the Tower Ballroom, in Blackpool, the prestigious event saw Liam nominated as ‘Apprenticeship Champion of the Year’ and given a taste of stardom, as he walked the red carpet, dined on a two course meal, and enjoyed a glittering ceremony. Liam completed a Level 3 in Hairdressing and Level 3 in Barbering during his time at Nelson and Colne College, and after voluntary work secured his apprenticeship at Image Hair and Beauty, in Burnley. 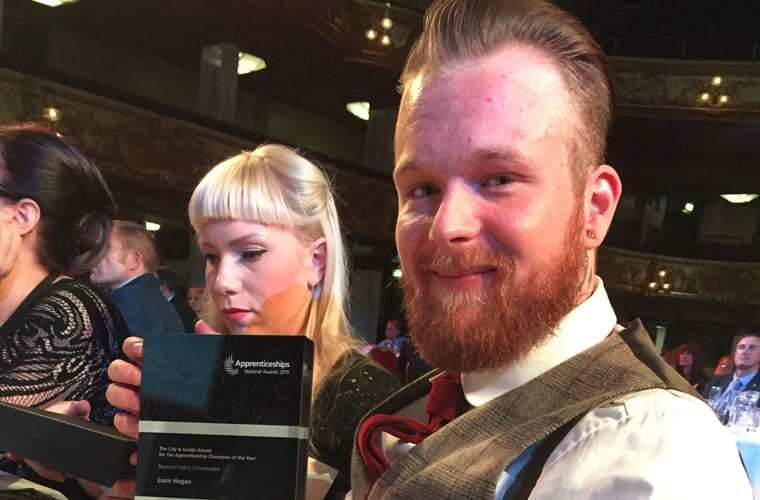 He went on to win the College’s Young Barbering Apprentice of the Year at its annual awards ceremony in 2013, buy Image, and expand the business to include The Old Fashioned Barber Shop. Liam said: “When the awards process began I didn’t expect to get through, so to be named as ‘Highly Commended’ was unreal for me! “My time at Nelson and Colne College was great and I really would recommend it to anybody. I arrived at Nelson and Colne College with a desire to be successful but no formal qualifications. The support and belief of the College’s apprenticeship team as well as my employer during my training helped me to achieve and exceed my own ambitions. “For anybody thinking of doing an apprenticeship I would say ‘stick at it, as it is definitely worth it’ – it is more hands on than some qualifications, you can learn while working, and you are getting paid as well. Nelson and Colne College hairdressing tutor Kathryn Walsh, who also attended the awards ceremony, said: “We are so proud of Liam’s achievements and could not be more thrilled that he has managed to beat such tough competition in the regional finals of the National Apprenticeship Awards. The National Apprenticeship Awards are now in their 12th year and celebrate the success of the country’s most exceptional apprentices and apprenticeship employers. The awards challenge top apprenticeship employers and apprentices across England to come forward and show how apprenticeships have made a real difference to their organisation and careers. North West – Liverpool, Cumbria and Lancashire’s winners and highly commended entries were announced at a high profile ceremony, organised by the National Apprenticeship Service. Nelson and Colne College offers a diverse selection of apprenticeship programmes in areas such as Catering, Business Administration, Engineering and Health and Social Care. An Apprenticeship is a work-based training programme, which leads to a nationally recognised qualification. For more information about apprenticeships at Nelson and Colne College visit www.nelson.ac.uk or ring 01282 440319.